Karst topography is a three-dimensional landscape shaped by the dissolution of a soluble layer or layers of bedrock, usually carbonate rock such as limestone or dolomite. These landscapes display distinctive surface features and underground drainages, and in some cases there may be little or no surface drainage. Some areas of karst topography, such as southern Missouri and northern Arkansas in the United States, are underlain by thousands of caves. 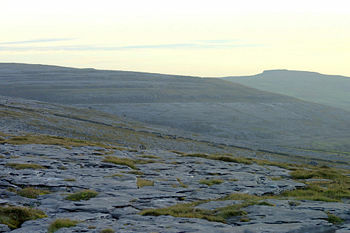 The karst hills of the Burren on the west coast of Ireland. Different terms for karst topography exist in other languages—for example, yanrong in Chinese and tsingy in Malagasy—a notable exception being English (Jennings, Ch.1 p.1). The international community has settled on karst, the German name for Kras, a region in Slovenia partially extending into Italy where it is called Carso and where the first scientific research of a karst topography was made. The name has Paleoeuropean origin (karra, meaning stone) and in antiquity it was called carusardius in Latin. The Slovenian form grast is attested since 1177, and the Croatian kras since 1230. Karst topography is characterized by subterranean limestone caverns, carved by groundwater. The Serbian geographer Jovan Cvijić's publication Das Karstphänomen (1893), based on his studies in the Dinaric Kras region, established that rock dissolution was the key process and that it created most types of dolines, "the diagnostic karst landforms." The Dinaric Kras thus became the type area for dissolutional landforms and aquifers; the regional name kras, Germanicized as "karst," is now applied to modern and paleo-dissolutional phenomena worldwide. Cvijić related the complex behavior of karst aquifers to development of solutional conduit networks and linked it to a cycle of landform evolution. Cvijić defined two main types of karst area, holokarst, wholly developed, as in the Dinaric region along the eastern Adriatic and deeper inland in the Balkan Peninsula and merokarst, imperfectly developed with some karst forms, as in eastern Serbia. Karst lake (Doberdo' del Lago, Italy), from underground water springing into a depression. This lake has no surface inlet or outlet. 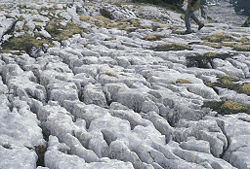 Karst landforms are generally the result of mildly acidic water acting on soluble bedrock such as limestone or dolostone. The carbonic acid that causes these features is formed as rain passes through the atmosphere picking up CO2, which dissolves in the water. Once the rain reaches the ground, it may pass through soil that may provide further CO2 to form a weak carbonic acid solution: H2O + CO2 → H2CO3. Recent studies of sulfates in karst waters suggests sulfuric and hydrosulfuric acids may also play an important role in karst formation. This mildly acidic water begins to dissolve the surface and any fractures or bedding planes in the limestone bedrock. Over time these fractures enlarge as the bedrock continues to dissolve. Openings in the rock increase in size, and an underground drainage system begins to develop, allowing more water to pass through and accelerating the formation of underground karst features. Somewhat less common than this limestone karst is gypsum karst, where the solubility of the mineral gypsum provides many similar structures to the dissolution and redeposition of calcium carbonate. The karstification of a landscape may result in a variety of large or small scale features both on the surface and beneath. On exposed surfaces, small features may include flutes, runnels, clints and grikes, collectively called karren or lapiez. Medium-sized surface features may include sinkholes or dolines (closed basins), vertical shafts, disappearing streams, and reappearing springs. Large-scale features may include limestone pavements, poljes and blind valleys. Mature karst landscapes, where more bedrock has been removed than remains, may result in karst towers or haystack/eggbox landscapes. Beneath the surface, complex underground drainage systems (such as karst aquifers) and extensive caves and cavern systems may form. 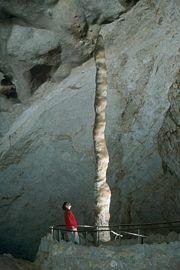 The Witch's Finger stalagmite in Carlsbad Caverns. Erosion along limestone shores, notably in the tropics, produces karst topography that includes a sharp makatea surface above the normal reach of the sea and undercuts that are mostly the result of biological activity or bioerosion at or a little above mean sea level. Some of the most dramatic of these formations can be seen in Thailand's Phangnga Bay and Halong Bay in Vietnam. The Rock of Gibraltar is an example of a monolithic limestone promontory. Calcium carbonate dissolved into water may precipitate out where the water discharges some of its dissolved carbon dioxide. Rivers which emerge from springs may produce tufa terraces, consisting of layers of calcite deposited over extended periods of time. In caves, a variety of features collectively called speleothems are formed by deposition of calcium carbonate and other dissolved minerals. A karst river may disappear underground a number of times and spring up again in different places, usually under a different name (like Ljubljanica, the river of seven names). Farming in karst areas must take into account the lack of surface water. The soils may be fertile enough, and rainfall may be adequate, but rainwater quickly moves through the crevices into the ground, sometimes leaving the surface soil parched between rains. 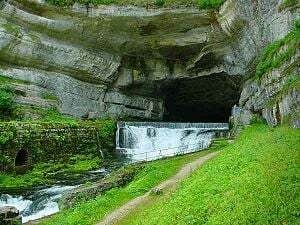 The source of the river Loue is a karst spring. A karst fenster is a place where an underground stream emerges onto the surface between layers of rock, cascades some feet, then disappears back down, often into a sinkhole. An example of this occurs in Lycoming County, Pennsylvania. Water supplies from wells in karst topography may be unsafe, as the water may have run unimpeded from a sinkhole in a cattle pasture, through a cave and to the well, bypassing the normal filtering that occurs in a porous aquifer. Karst formations are cavernous and therefore have high rates of permeability, resulting in reduced opportunity for contaminants to be filtered out. Groundwater in karst areas is just as easily polluted as surface streams. Sinkholes have often been used as farmstead or community trash dumps. Overloaded or malfunctioning septic tanks in karst landscapes may dump raw sewage directly into underground channels. The karst topography itself also poses some difficulties for human inhabitants. Sinkholes can develop gradually as surface openings enlarge, but quite often progressive erosion is unseen and the roof of an underground cavern suddenly collapses. Such events have swallowed homes, cattle, cars, and farm machinery. The Driftless Area National Wildlife Refuge in Iowa protects Discus macclintocki, a species of Ice Age snail surviving in air chilled by flowing over buried karst ice formations. Pseudokarst refers to landscape features similar in form or appearance to karst features, but are created by different mechanisms. Examples include lava caves and granite tors (such as Labertouche Cave in Victoria, Australia), and paleocollapse features. A partial list of karst areas around the world is given below. Area around Guilin and Yangshuo in Guangxi Zhuang Autonomous Region, China. Zhangjiajie National Forest park, forming part of the Wulingyuan scenic area (a UNESCO World Heritage Site), Zhangjiajie Prefecture, Hunan, China. Limestone eastern foothills of Maya Mountains including parts of the Cockscomb Basin Wildlife Sanctuary. Cockpit Country, a region in Jamaica. The Herzegovina region of Bosnia-Herzegovina. The regions of Dalmatia, Lika, Gorski kotar, Kvarner and the islands in Croatia. The Central Rhodope karst in Bulgaria (Trigrad Gorge and caves), the Devnya Valley (karst springs). The region of Inner Carniola in Slovenia. Kras, a plateau in southwestern Slovenia and northeastern Italy. Murge, in Apulia and Basilicata, southern Italy. The Picos de Europa and Basque mountains, northern Spain. The Ciudad Encantada in the Cuenca province (Castilla-La Mancha). El Torcal de Antequera nature preserve, southern Spain. The White Peak of the Peak District, UK, around Matlock, Castleton, and Thor's Cave. Yorkshire Dales (including Malham Cove), England. The Swabian Alb region in the federal state of Baden-Wuerttemberg in southern Germany. The "Ares de l'Anie, in the southernmost part of Barétous valley, South-West of France. The Rock of Gibraltar, located at the sothernmost tip of the Iberian Peninsula. The Nahanni region in the Northwest Territories, Canada. Monkman Provincial Park in the Northern Rockies, Canada. Portions of the Niagara Escarpment, Ontario, Canada. The Cenotes of the Yucatan Peninsula, Mexico. Huntsville, Alabama, and the North Alabama Region, U.S.A.
Coulee Region in the American Midwest, U.S.A.
Mammoth Cave area and Bluegrass region of Kentucky, U.S.A. 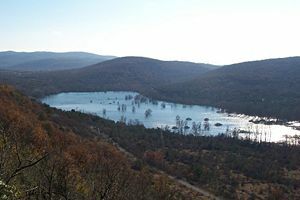 The Ozark Plateau of Missouri and Arkansas, U.S.A. The Karst forest in Puerto Rico, U.S.A. The Cumberland Plateau in Middle Tennessee, U.S.A. The Hill Country of Texas, U.S.A.
Presque Isle County near and around Rogers City in northern Michigan. The campus of the University of California, Santa Cruz. The Shenandoah Valley of Virginia. Glossary of Cave and Karst Terms Speleogenesis and Evolution of Karst Aquifers. Acta Carsologica A journal with research papers and reviews in all fields related to karst. This page was last modified on 13 April 2018, at 14:28.